This is an MBA project report on "Effect of media, message and style on movie marketing" and good for reference for management students who have marketing as their major. This report is made seeing present scenario of movie marketing. You must have seen that film maker are investing lots of money in marketing and trying to create hype and craze among public. You can also Subscribe to FINAL YEAR PROJECT'S by Email for more such projects and seminar. This project report gives details about the marketing mix of entertainment service marketing mix and gives an insight view of conventional and unconventional promotional champing of Bollywood movie marketing. The methodology employed for researching on this subject comprised of literature review wherein four reports (one dissertation on film marketing, report by Mr. Tarun Tripathi, ex-CMO, Yashraj Films Ltd. and two FICCI Frames report dated 2003 and 2006) were studied and reviewed. This literature review formed the basis of the dissertation. Marketing in movies always existed but never in such a big way as today. Everyone in the marketplace wants to be seen and heard but the person who manages to do that better than others walks away with the success. 1. No particular preference for conventional or non-conventional media/method came out. As a matter of fact, the communication media be it the traditional ones or otherwise, has to be in synchronous with the movie content, positioning of the movie and the target audience. 2. 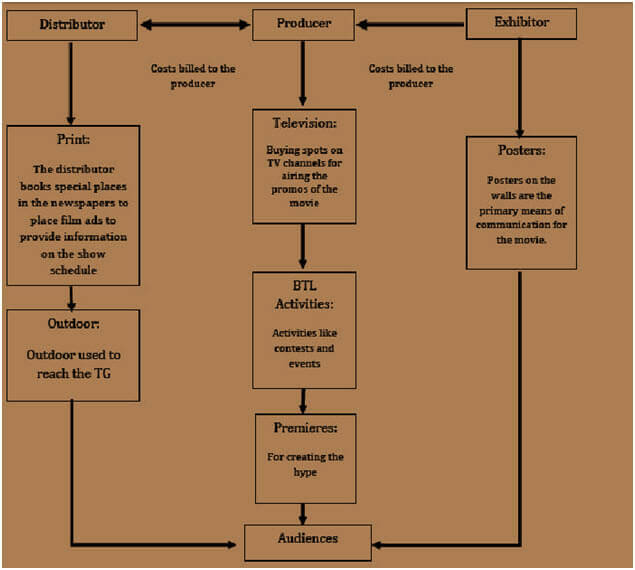 The research proves that the way of interpreting the film’s texts (in this case all the communication targeted for marketing purposes) differs from age to gender to geography and hence marketing would differ likewise and hence its marketing success would also differ within all those parameters. 3. After studying the cases we also get to know that newer mediums need to be explored for the same medium needs to be used innovatively to get the noise louder. All of this works under the assumption that the content happens to be good which a very case to case basis is. Use this report for your reference and study work only and all credits goes to author of this MBA project and are given below.